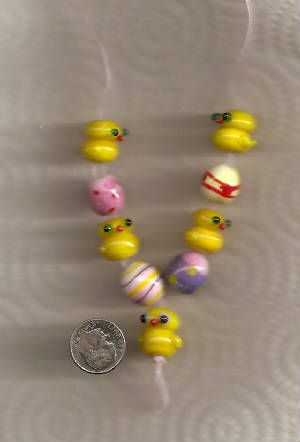 "Chic Chicks" Five nifty lil' chicks measuring from 13mm to 15mm. Also 4 Easter eggs about 12mm wide and 14mm wide. $22.00 for the set. "Glyphs"- A set of 14 round "cake" beads and 1 focal bead. The cake beads measure about 13-15mm and the focal measures about 24mm long by 20mm wide. Price $20.00 for the set.